When of my favorite types of food is tapas. These are small plates intent for sharing. They are a great way to get a sampling of many different dishes. Recently, I found a great tapas restaurant in the Reston Town Center: the Barcelona Wine Bar. Reston is not the restaurant’s only location, as it is a small chain with a dozen or so locations. Barcelona Wine Bar was started by C. Andrew Pforzheimer and his business partner, Sasa Mahr-Batuz, in the mid-1990s near their home in South Norwalk, Connecticut. Their goal was to recreate the feel and the look of an evening in Spain. Since that time, the number of locations has grown. Most of them are on the east coast, but they do have one in Denver, Colorado and one in Tennessee. As I’ve said before about tapas restaurants, it is best to go with more that one person so you can share lots of plates. I did that at Barcelona with one friend, allowing us a small sample of their dishes. 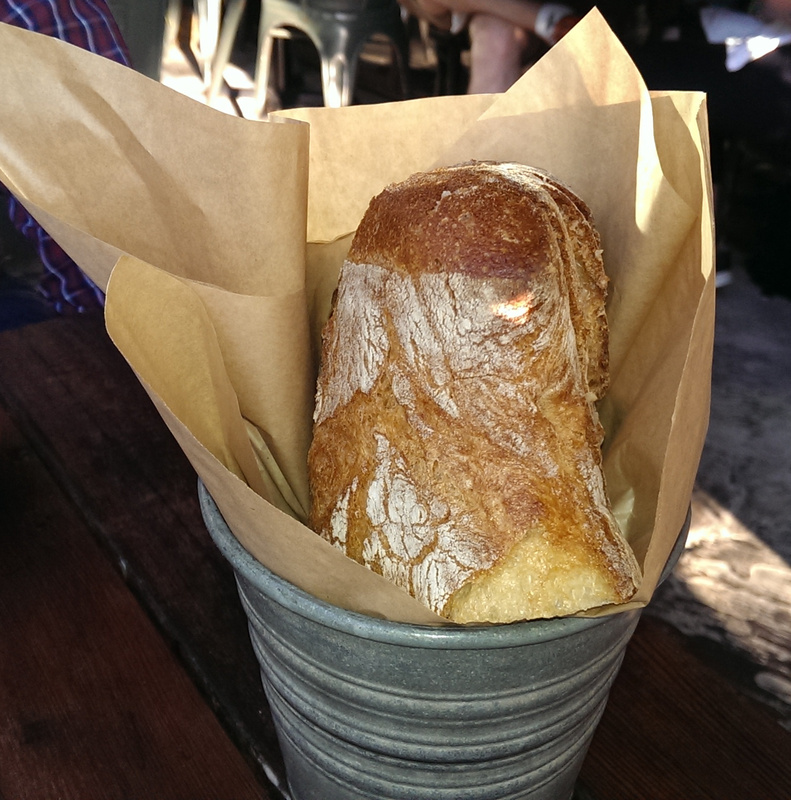 Before our order arrived, we were served with a half loaf of fresh bread. This was baked in a typical European style, hard and crunchy on the outside and soft on the inside. Still hot and served with a plate of olive oil, it was a great way to start the meal. We also ordered a carafe red Sangria. This was refreshing,but the fruit seemed like it was just added, rather than soaking in the wine. 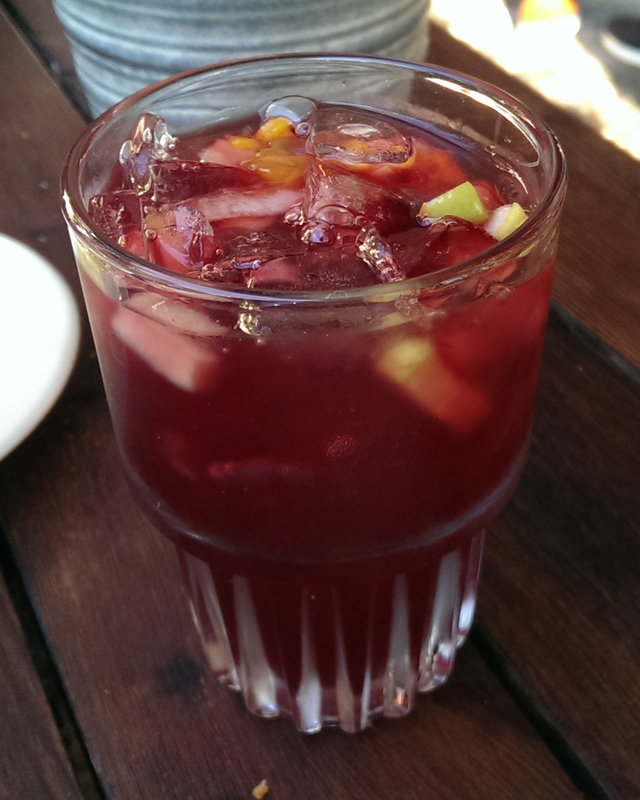 The wine itself had great depth of flavor, so maybe the fruit was added to some pre-made sangria. The dishes we ordered were: eggplant caponata, hangar steak, spicy beef empanadas, roasted Piquillo peppers, and a tomato dish whose name I forget but was essentially a caprese salad but made with burrata cheese instead mozzarella. Our hands down favorite was the eggplant caponata. Substantial and flavored with a unique mix of spices, it went really well with their bread. We loved it and almost ordered a second helping. The runner up was the hangar steak. It was grilled to a perfect medium rate and served with a tasty sauce that was to die for. The remaining dishes, for the most part, were very good. While not standing out like our top two, they were all tasty. With the exception of two dishes. One, the artichoke hearts needed some more seasoning, or more time marinating, as they did not have a strong taste. Two, the tomato dish was very disappointing as the tomatoes were dull and bland; the kind of tomato you find when they are not in season. All in all, I would recommend the Barcelona Wine Bar. They make the food extremely well and they have a good selection of wine. I liked the atmosphere as well; upscale but with a nice ethnic feel.